Cattle Battle 28 with Level 13. Need some advise on how to get through this base with only mediocre cards while still at level 13. Yes! I know the obvious answer is to level up further etc etc. But that is not the challenge. Do we have anyone that is consistently able to get this base ? Currently I find the enemy Tin Men stall my attack too much. Advice on how to deal with them will be much appreciated. Hi Coldet, you are doing a great job doing lvl 28 cattle battles at player lvl 13. You have answered your own question. Your players are out gunned by much stronger sidekicks. Tinmen at lvl 28 will usually be veteran or notorious strength so all of your troops will struggle to bring them down quickly. Leveling up your saloon to get advanced troops is really your only option mate. But keep up the good work. Plenty of posse's would love to get you on their team. 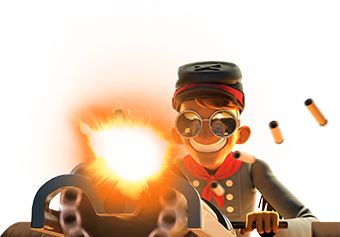 Gold Rush this event so send some trains and strengthen your players. Thanks for the response Grumpy (lol - it feels like I'm talking to myself). I've done a number of events since I posted the OP. I have found CB28 to be my nemesis BUT YES I am now regularly (8xlevel 13 accounts) able to get through level 28 and beyond to the max CB32 maps with these accounts. What I discovered in the interim is that you very seldom get maps with the same layout and one event/account can come across a layout that WILL NOT go down. no matter how many different approaches you try. Basically to get through these tough bases you generally need to take it slow paying very careful attention to your rally flagging and lay down as much firepower as you can. I am aware of a guy (Krax Level 14) that has "Only Gunslingers" and he recently managed getting beyond CB28 - ok to be fair his GS are all Notorious. But its is still impressive. BTW. Max level 32 Gold Rush at level 13 is ridiculous. With Fort level 7 I'm able to drop 7 Rugged Rangers then go make coffee and return to send the train on its way.